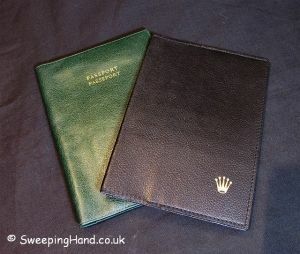 Win a Genuine Rolex Leather Wallet / Passport Holder! Today we reached over 300 ‘Likes’ on the Sweeping Hand facebook page which is a phenomenal result in such a short period of time. To celebrate and to try and push on to the next goal of 500 I thought I would do another little giveaway of a genuine Rolex leather wallet or passport holder! Every new person who ‘Likes’ the SweepingHand Facebook page by clicking HERE or clicks the facebook logo at the top right hand side of this page and then ‘likes’ the page on facebook will go into the prizedraw. If you have already liked the SweepingHand facebook page then you can still enter by simply CLICKING ON THIS PAGE and then clicking ‘Share’ to your profile. Please share the link to your profile and help us get to 500! PreviousPrevious post:Rolex Red Submariner 1680 For Sale – 1972NextNext post:Omega Seamaster 300 For Sale – 165014-64 : Rare 1966 Stunner! TV ‘Expert’ Offers £220 for a 1960’s Rolex GMT 1675 PCG Gilt Dial Watch!! What is a ‘GRAIL’ watch and why? I’m sure I can fill it with some old Deutsche Marks for you mate!